Photography by Bill Wood. Text by Diane Keaton, Marvin Heiferman. Steidl/ICP, 2008. 246 pp., 300 black & white illustrations., 11¾x9¾". BillWood’s business was photography, and he produced tens of thousands of images over the course of his career. A tall, slender, hardworking family man with a penchant for bow ties, Wood (1913–1979) was born, lived and died in the Fort Worth, Texas area, and his photography played a central role in how his clients chose to see and to portray themselves and their city. 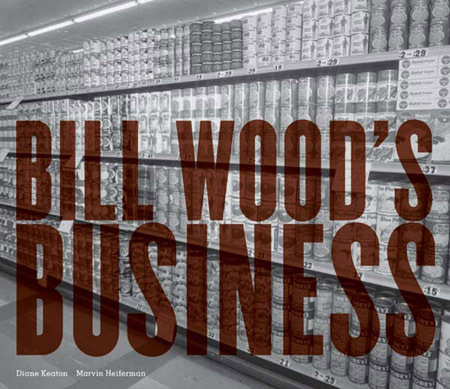 Bill Wood’s Business features approximately 300 of Wood’s photographs, along side essays by Diane Keaton and Marvin Heiferman that pay homage to the skills Wood (and professional photographers like him) brought to the business of photography. What drew Keaton and Heiferman to this project was the extraordinary range of Wood’s images, as well as a shared appreciation of archives and the construction of photographic realities. In an earlier collaboration, Still Life (1982), Keaton and Heiferman explored the Surrealism, the fantasies and the economic motivations percolating beneath the surface of the glamourous color publicity photographs that Hollywood studios orchestrated and distributed in the mid-twentieth century. Since then, Keaton (in her film and book projects) and Heiferman (in his curatorial, writing and publishing work) have continued to survey the quirks of American iconography. Keaton purchased the archive of Wood’s negatives 20 years ago, and in Bill Wood’s Business, she and Heiferman team up again to look at and through photographs, to show what they are intended to depict and what they actually reveal.